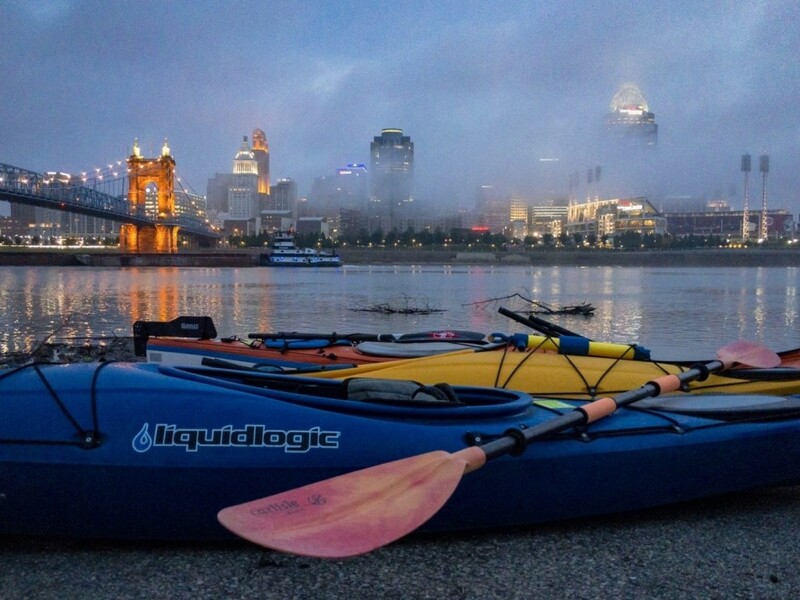 Light fog greeted the Sunrise Paddle event this morning, but paddlers are a resilient folk. I am grateful that Amy Allen asked Murphy and I to join them, and want to thank Bill Swanson for bringing an extra kayak for Murph and I to enjoy! Though Murphy and I have been on many adventures together, this was his first time in a kayak. I was concerned that he might be anxious, but he jumped in, sat on my lap, put his paws up on the deck, and there he sat, calmly for the entirety of the trip. Looked like he’d been doing it all his life. There are many events planned for Friday night and, of course, the big paddle Saturday morning. 9 miles of the Ohio River will be closed to motorized boat and barge traffic, while thousands of self propelled watercraft splash their way from the Schmidt Recreation Complex, to the finish line at Gilday Riverside Park. More information can be found at the Paddlefest Website . Hope to see you there! Thank you all for coming along on our continuing adventure, and we wish you a wonderful weekend. Happy Murphy-Cam! Thanks SO much for joining us this morning. Your pics are so beautiful. Can I have your permission to post them at some point with credit? Thank you for organizing a wonderful event, and the kind words. You certainly may use them. Very best regards! Thank you for the nomination Allan. How very kind.